Lunar Eclipse - During a lunar eclipse, the Moon passes behind the Earth and Sun into the Earth's shadow. 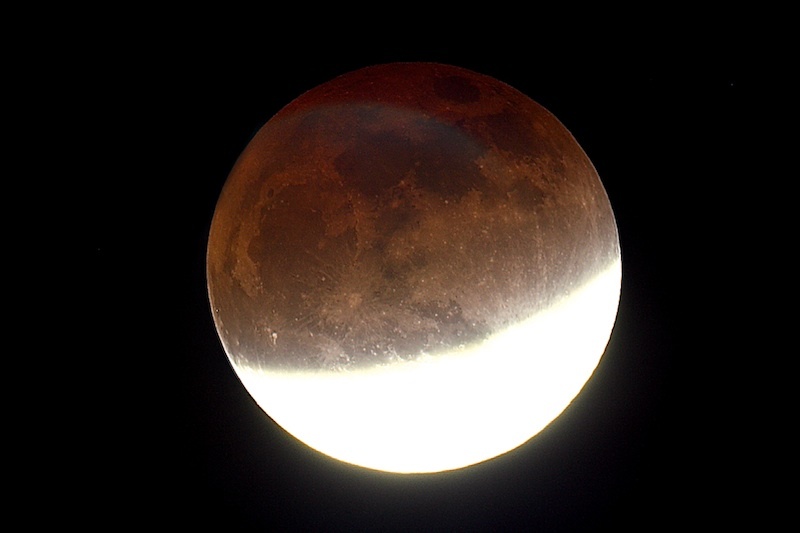 In this picture of the lunar eclipse of December 10, 2011, the Moon is divided into a bright portion which appears white and overexposed, and an orange or rusty colored darker portion. The bright portion is still in the Earth's Penumbra, the lighter part of the Earth's shadow. The darker portion is covered by the Earth's Umbra, the darkest central part of the shadow. In the total phase of a lunar eclipse, the entire Moon will be in the Umbra and thus appear orange, as can be seen in this picture.